A Complete Online Marketing Solution! At Probate.com, we know that lawyers are always looking for the next big thing. Well, we’re here to offer it.  We have launched our most aggressive internet marketing package ever. Better yet, it will be offered only to a select few estate planning and probate attorneys. If you are looking to expand your online presence, we have more than just a listing, we have an all-inclusive online marketing solution. By signing up to reserve your spot with us today, you can take advantage of our comprehensive solution to help grow your business online and to increase the amount of new clients you receive from the Internet. Ever feel as if you’ve found the ideal marketing solution? Ever realized that thousands of other attorneys and law firms have found it too? At Probate.com, we know just how frustrating it can be to have to share the spotlight. No matter how comprehensive or successful an online marketing solution is, when divided amongst hundreds of attorneys in a single area, the impact becomes severely diluted. For this reason, we are proud to become semi-exclusive in 2013. When you reserve a spot for our new product, you won’t have to worry about having to fight for attention – instead, you will get the VIP treatment that you deserve. Finally, an Online Marketing Solution That Works! Probate.com is proud to announce that we have launched a brand new, comprehensive online marketing solution. This new solution will be geared specifically toward probate and estate planning attorneys and will be limited to one firm in smaller counties and no more than six in the largest. Become Part of the Probate.com Network! When you sign up for this limited time offer, you receive the opportunity to become part of the expansive Probate.com network. As this is a semi-exclusive marketing campaign, your firm is featured in your area and you aren't buried under hundreds of other listings. 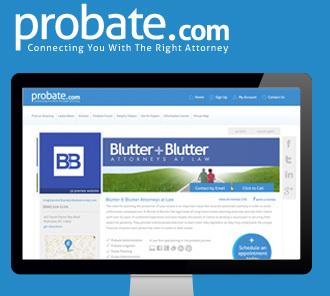 Probate.com will help people nationwide to find the local attorney they need. Probate.com has partnered with legal marketing leader, Scorpion Design, to handle your new marketing website, search engine optimization and lead generation from other online efforts. Not only will you get access to a new website with professionally written and optimized content, your site will be continually worked on by SEO experts to help gain organic rankings and drive more people to your site. All included in your Probate.com marketing solution. More people are searching on the go than ever before; therefore, if you want to get the leg up, you need to have a website that is mobile-friendly! As part of your marketing solution, your new website will be created to drive new clients in from mobile search, and be accessible from all mobile devices, allowing visitors to navigate your site no matter where they are. Included in the monthly cost, Scorpion will run basic paid advertising for your site in Google, Yahoo!, Bing, Facebook and more. Looking to supercharge your marketing? Your expert web marketing team can adjust your search engine advertising to drive more calls when you need them, and turn it down when you are too busy. Just set the extra monthly budget with your marketing team and away you go! Over the next year, Probate.com has an estimated one million dollar marketing campaign designed to drive new potential clients to the site and to you. Reserving your spot today is critical as your county may soon be sold out! With the incredible exposure we will be gaining from paid and organic traffic, you will look back on this decision as your best marketing move of 2013.